Leading while female--whether in business, politics, the home, local communities, or the church--can be incredibly life-giving and spiritually fulfilling, yet lonely and difficult. "We Pray with Her" means supporting all the hers, both established and just starting up the ladder, who are leading the charge in today's culture. It is a commitment to let them know that they are not alone, and that we are praying with along with them. In a world of glass ceilings, harassment, and "boy's clubs," women often encounter obstacles when they seek to forge ahead in their work to leave a positive mark through their labor, personal efforts, and causes. Women business leaders, political candidates, clergy, and trailblazers of all kinds need the support and encouragement of their fellow women. We are not intended to walk through life alone, and by raising each other up in prayer we will in-turn be inspired in our own efforts, grow in our faith, be understanding of shortfalls, and celebrate successes along with our fellow women. 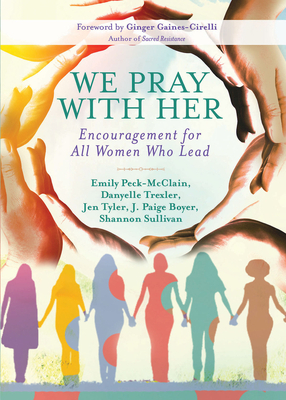 This inspiring devotional is a collection of 100 entries written by the women of WePrayWithHer, a grassroots movement turned online collective of women faith leaders, explores themes such as call, vocation, persistence, resistance, and struggle. Whether you're a woman leader looking for personal inspiration, in a supportive role to a leader, an aspiring leader, or a woman who wants to support her sisters in Christ, you'll find a home within these pages. Join the movement with your prayers, by mentoring, and through daily acts of solidarity with the women in your life and community. In these readings you'll be emboldened to support one another as we strive to live the life to which God has called us.